But what happens when the scaffold leg is near a trench? How does this affect the bearing capacity? To answer this question we need to know how the soil reacts when we place a load on the surface. Essentially when we push down on the soil it pushes back as hard as we are pushing down (if not, we sink into the soil). 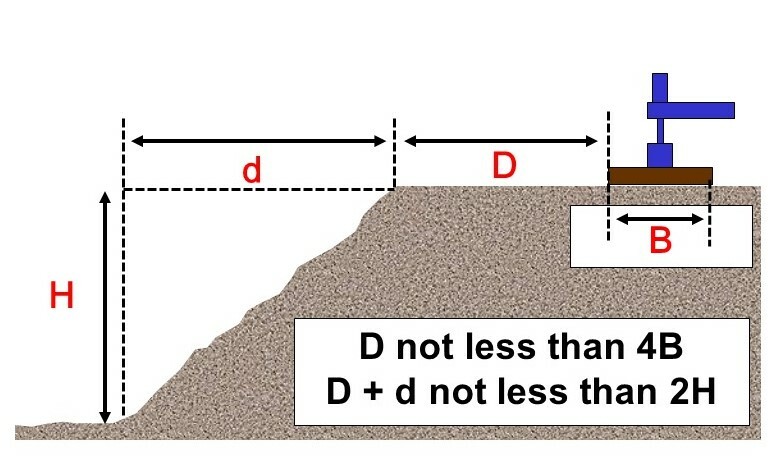 If we look at, say, a thousand pound load on a one-foot square sill (1,000 psf), the compressed soil pushes back with this same force directly under the ground pad (sill) as seen in Figure 1. Also notice that the farther we go down into the soil the more spread out and diffused the soil compression becomes. So a load on the soil surface creates a compression cone beneath it that supports the load. As long as the load is far enough away from the excavation so that the removal of the soil (when digging) doesn't compromise the structural integrity of this compression cone, the soils should not fail. From the point of view of the excavation competent person, they are trained to identify what is called the "affected zone." This is an area alongside the excavation that is as wide as the trench is deep. So you measure the trench depth and then go back this same distance from the lip. That defines the affected zone. 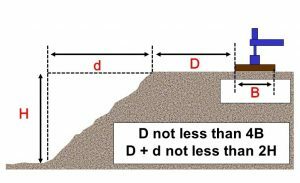 Loads imposed on the surface of this affected zone (pipes, equipment, spoil piles, and scaffolds for example) can make the walls of trench more unstable by increasing the lateral earth pressure. So if we keep our scaffold well out of the affected zone, our scaffold and our trench should be fine. Figure 2: The IPAF guidelines addressing the proximity of surface loads to the edges of excavations and embankments. The International Powered Access Federation (IPAF) published a newsletter (Issue 2/26.08.06) in which they looked at the location of outriggers on cranes and other equipment with respect to excavations and embankments. Their guidelines can be seen in Figure 2. Note that this guideline takes the width of the ground pad into account. Although not specifically targetted at the loads created by scaffolds, the same basic principles of soil mechanics would apply. When dealing with both excavations and scaffolds you always need to err on the side of safety which means that you understand the basic limits and take care not to get anywhere near them. These limits are intended to address common work situations. Extremely heavy-duty scaffolds and irregular excavations on layered or other types of complex soils may make these guidelines unsuitable. This is why every competent person needs a cell phone so they can call someone when a situation seems uncommon. Remember, it's always better to call before the fact and ask for advice than to call after the fact and ask for an ambulance.